The painter and draughtsman Lucas van Valckenborch belonged to a Flemish family of artists which produced no less than 14 accomplished painters over three generations, of which Lucas, his brother Marten (1534-1612) and his nephews Frederick (1566-1623) and Gillis (1570-1622) are the most celebrated. Born in Leuven in the Southern Netherlands, details about Lucas’ youth and apprenticeship are unknown. By 1560 he was registered as a master in the Guild of St. Luke in Mechelen, where he married and had a son in 1566. During the same year Lucas and his family escaped political and religious unrest in his home country, settling first in Liège, and later in Aachen (Germany), where his brother lived. From 1574 to 1575 he worked in Antwerp, and in 1579 accepted an appointment as a court painter of the Habsburg Archduke Matthias of Austria, Governor of the Low Countries in Brussels. When his employer returned to his residence in Linz in 1581, Lucas moved with him to Austria. By 1593 he finally settled down in Frankfurt/Main (Germany), where he established a flourishing workshop together with his brother Marten. He died in Frankfurt in 1597. 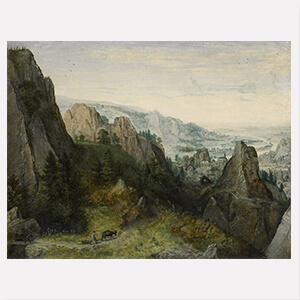 Lucas van Valckenborch’s known oeuvre consists of about one hundred paintings and ten drawings. Stylistically, his work shows strong influence by Pieter Bruegel the Elder (1528-1569), whom he met as a young master in Mechelen. Although Lucas van Valckenborch was a skilful portraitist and also produced numerous paintings featuring religious and genre themes, he is best known for his landscapes, which often include vast panoramas, presented from a high viewpoint. In his compositions the artist typically liked to mix reality and invention, blending finely detailed and topographically correct views of recognizable cities like Liège, Antwerp, Vienna, and Linz with imaginary and narrative elements taken from everyday life.